"Being a part of Orange is a critical aspect for us so we do community outreach through various opportunities, all charity and directed to schools. We want the families, the people, and the fabric of the town to enjoy our experience together." Open just a few months now, the Burger Parlor's second location in Old Towne Orange has already found plenty of guest traffic from its loyal fanbase as well as those who are walking through, experiencing what the historic area has to offer. It has been an organic growth that has proven just how much need there was for a unique menu of solid burgers and fries. If you are familiar with the Fullerton location where the restaurant staked its first roots, you might notice the similarities with the Orange location: 100 year old exposed brick walls, an outdoor patio, two points of entry, and so forth. Part of that is a result of the lot chosen in Old Towne Orange but the other part is Mahon's hand in designing the spaces himself from the materials used to elevation drawings to the logo and story. There were some liberties taken in this heritage building including turning a previous office into a taproom and expanding the dining room capabilities beyond just a handful of guests. Add in the similar demographics from both cities and you'll find yourself a burger parlor's success. Mahon himself has paid his dues in the culinary world for many years, most recently as the Executive Chef of Bastide, a West Hollywood Michelin-star restaurant that has since closed, and with posts in France, London, New York, and so forth. He has seen the rigorous actions of fine dining and infamous restaurants and worked countless hours in both independent restaurants and large corporations. 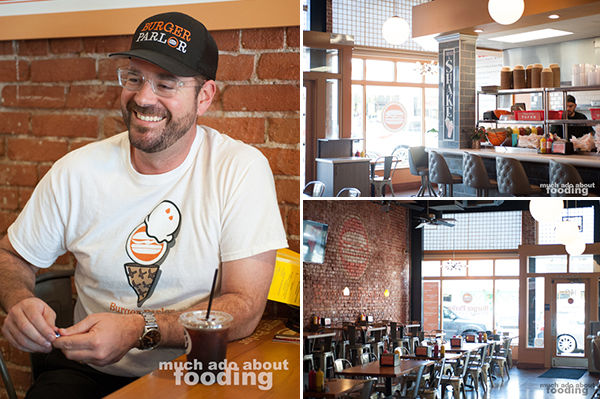 With these struggles in mind, Mahon turned his attention to building his own burger spot once he and his wife moved to Orange County, a way to take ownership of every aspect of the industry and develop business know-how beyond behind the burner. "I think that's why I get along with our kitchen team so well. I've been in their shoes. I can relate to them, talk their talk, and walk the walk. It's all about our team - having a culture of constant improvement and letting them make mistakes to learn from. We've maintained a core Burger Parlor team for 3-4 years instead of the typical "few months" in the industry." "It's my job to equalize the marketplace and give our communities a quality burger place without cutting corners. They really want establishments similar to this." 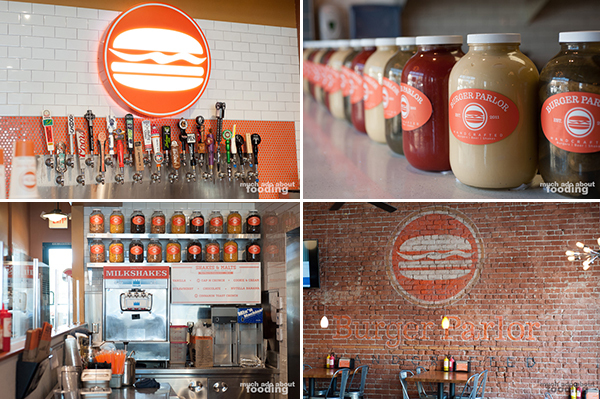 Burger Parlor prides itself in its ingredients. The patties are antibiotic-free Nebraskan beef blended in-house from four cuts of meat. After much R&D, they've created a burger bun that plays the balance between being a brioche and Hawaiian roll. As Mahon puts it, they "take all the unnecessary steps and make them necessary" which is why their sauces are made in-house, their meats are blended by their own team, buttermilk chicken pieces are marinated for 48 hours before frying, and sides like onion rings and fries are sliced and fried to order. 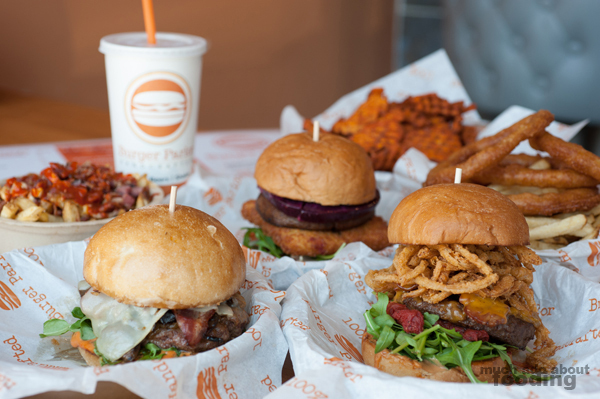 Though some guests may be okay with frozen or premade dishes, one of Burger Parlor's core values is to do it right and do it fresh with a "less is more" attitude when it comes to showcasing food's actual flavors. It shows. 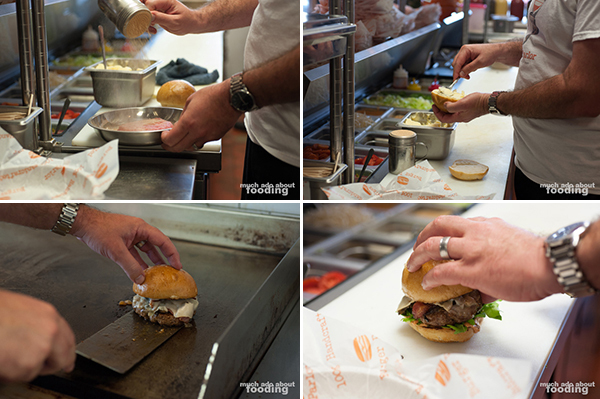 After chatting with Mahon about more than can fit into this article and taking a behind-the-scenes peek at the making of an Orange-location-only burger, we sat down for some tastes. The flight of sides were up first, and their sheer quantities left us packing up a few boxes to take home. 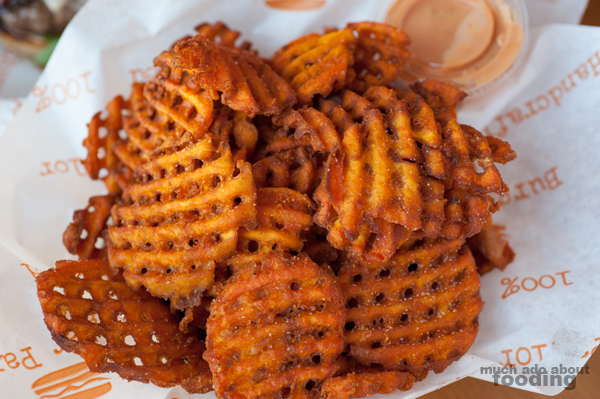 We had to get some bites of the Sweet Potato Waffle Fries ($4.59 - served with honey chipotle aioli) - there is something alluring about that particular shape of "fry" that also serves a dose of nostalgia along with it. I can't remember where I used to have waffle fries as a kid but it was some fast food spot that was a treat. These were thick and hearty, a great match for the spicy-sweet aioli that came along with it. 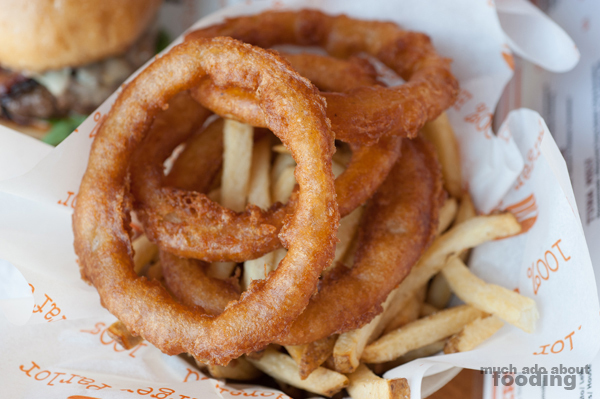 Our basket of the Half & Half ($4.39 - half fries with sea salt, half beer-battered onion rings) was formidable with the over-sized onion slices but we powered through their beer-battered shells and really enjoyed the sea salt on each well-done fry. Definitely some of the better fries that we've had before. 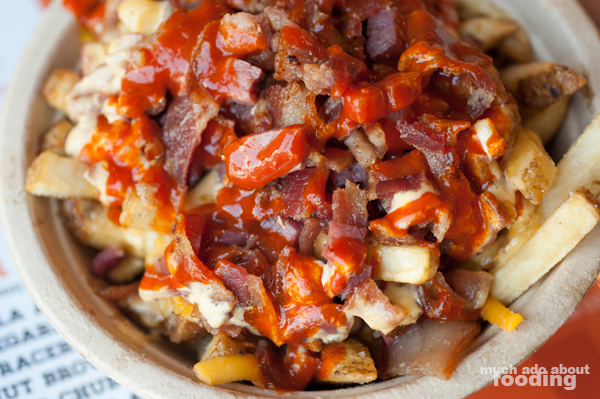 To capitalize on that preference, the Kevin Bacon & Pastrami Fries ($6.95 - traditional fries, aged Wisconsin Cheddar, cheese sauce, bacon, housemade hot sauce, and pastrami) hyped the spuds to a whole other level with smothered heart-stopping toppings. The side order was good but I could only stomach a bite or two before needing to save room for the stacked, hefty burgers next. Each burger patty is 6.2 oz in size and proudly sourced 100% antibiotic-free from Omaha, NE. 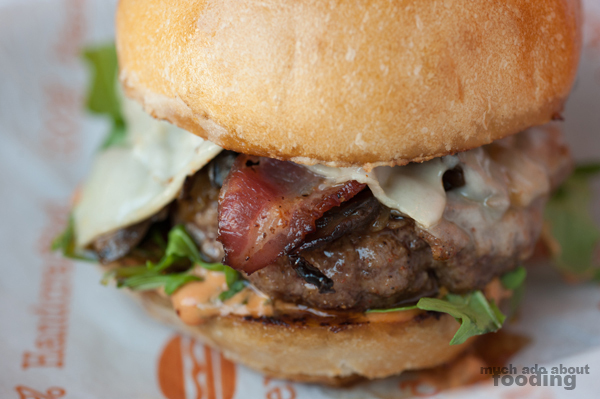 The one we saw built in the kitchen was The Orange Plaza ($10.79 - Parmesan-grilled sourdough bun, smoked bacon, Fontina, caramelized onions, mushrooms, arugula, and chipotle aioli), an exclusive to the Orange location for Burger Parlor and a bit of tribute to the community there. All the fixings on here oozed umami and really suckered you in for bite after bite. Even knowing that the beef was such a highlight of Burger Parlor, I just had to visit the Portland ($8.95 - marinated beets, fried Mozzarella, sprouts, arugula, pickled carrots, oven-roasted tomato, and herb sauce; can add or substitute crispy Portobello or grilled Portobello) burger because it was on their vegetarian menu. It isn't often that places make impressive vegetarian offerings for those herbivore friends that join you for meals but this was something else. I had mine with both the fried Mozzarella and grilled Portobello and ended up finishing the whole burger because it was that good. 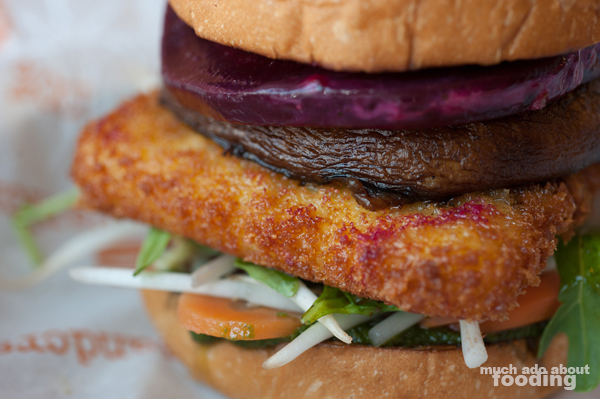 Savory from the herb sauce and "patty," peppery from the arugula, slightly tart from the beets and carrots, and crunchy from such fresh sprouts, this burger hit all the crucial elements and textures for an enjoyable and filling meal, vegetarian or not. 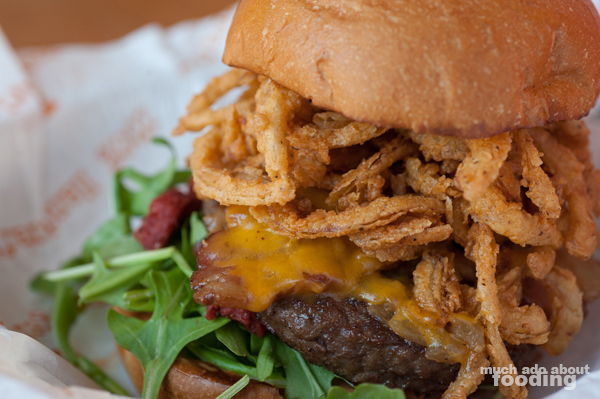 On the other side of the spectrum, Duc went meat-indulgent with the popular Smokey ($9.95 - smoked bacon, crispy onions, caramelized onions, Wisconsin Cheddar, arugula, oven-roasted tomato, and chipotle aioli) burger whose crispy onions made the burger topple over once served. We re-arranged as best we could so he could attempt to wrap his mouth around such a burger behemoth. It was juicy, it was pleasantly unctuous, and it was hearty. The verdict was that we had to come back for more. It's a pity we haven't been to Burger Parlor before but knowing what we do now and having seen what this second location has to offer, we'll be sure to stop by for some burger and fry goodness. Congratulations to Mahon and his team on the expansion with more planned in the future! Visit them at 149 N. Glassell St., Orange, CA 92866 and 204 N. Harbor Blvd., Fullerton, CA 92832 to get beefed up on burgers done well. Photography by Duc Duong. More photos available at Facebook here.